Strawberry season is in full swing here in the North East. 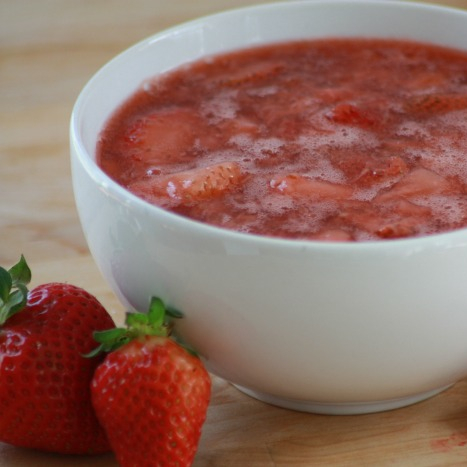 Whether growing your own, picking your own from local strawberry farms, buying them from the farmers market, or buying them from your local grocery store, this recipe is a must-make for anyone with a strawberry abundance. This strawberry syrup contains no undesirables! Kiss those conventional syrups goodbye and say hello to this deep, real strawberry flavor made from in-season strawberries. We love this syrup as a topping to pancakes, ice cream, cake, or simply eaten right off the spoon. This strawberry syrup contains no undesirables! Kiss those conventional syrups goodbye and say hello to this deep, real strawberry flavor made from in-season strawberries. Add all of the ingredients to a small saucepan. Stir well to dissolve arrowroot powder. Once liquid is warm, start to mash strawberries with a fork. Serve warm or store contents in a quart jar in the refrigerator for up to 10 days. *In a hurry? Simply pour contents into a blender and blend on low for 10 to 15 seconds. 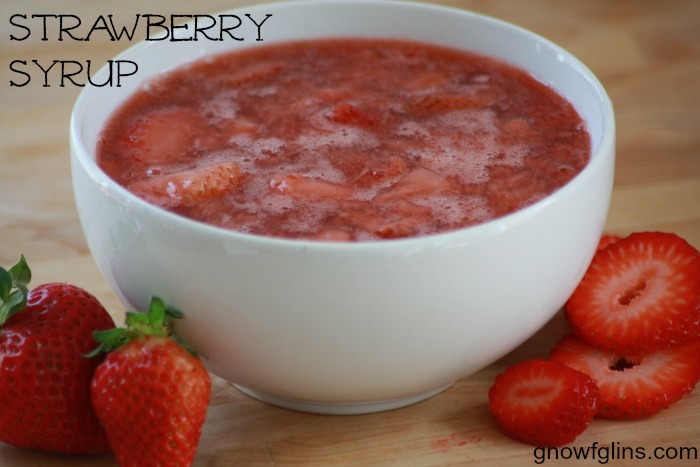 You don't want a puree -- rather a thick syrup-like consistency with small strawberry chunks. What's your favorite way to eat those delicious, seasonal strawberries? This looks so good. I look forward to giving this a try. I could probably do the same thing with blueberries right? Those are what are currently coming on here. Yes, although with blueberries, don’t blend. The berries will ‘pop’ and create a fabulous syrup. At the height of the season our strawberries are producing several quarts a day. We put them in bags in the freezer and use them for smoothies, jams and wine. It takes 4 one gallon freezer bags to make a batch of wine. I also puree some in the Vitamix and freeze them in shallow disks (in a “muffin-top” baking pan) so they will thaw faster when I need them for a sauce or strawberry-lemonade. What a great tip. I’ll be freezing some strawberry ‘disks’ this year! Wondering if this could be canned like strawberry jam? If it can be, I would think WB would be fine? I haven’t had strawberry pie since my conversion to traditional foods eight years ago. But we had an abundance of strawberries this year, so that got me searching for recipes so I could mimic my favorite childhood pie. I baked a pie shell, filled it with strawberries, used your strawberry syrup as the filling, and topped with whipped cream. OMG. Best. Pie. EVER. Next time I’ll probably use 3T of arrowroot because the syrup is too runny as a pie filling. I can my pears in the fall with homemade mulled cider. So I opened a jar of pears and used that pear/cider juice for this recipe. The flavor! Omg. Seriously the best strawberry pie I’ve ever had. Thank you for sharing this recipe!! This sounds great and I will be trying it, but it hardly sounds like a “syrup” to me. When I think of syrup, I think of something perfectly smooth and thickish. More like a honey consistency.